1. Place 1/8 of the cubed ham and 1 tablespoon each of onion, pepper, tomato and cheese on one side of each tortilla. 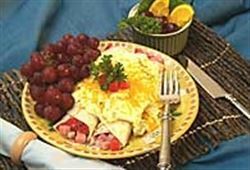 Roll up and place seamside down in a greased 9 x 13 inch casserole dish. 2. In a separate bowl combine eggs, milk, half and half, flour, and chilies. Blend with a wire wisk. Pour over enchiladas. 3. Bake, covered, in a 350 degree F oven for 40-50 minutes, or until egg mixture is set. Uncover, sprinkle top with remaining cheese, and return to oven to melt cheese (approximately 5 minutes). Enjoy this delicious enchilada breakfast casserole Mexican food recipe! I made this for the teachers at my daughters preschool and they loved it. I used sausage instead of ham and it was very, very delicious. I looks and smells good too!! !